On Track makes it easy to tell whether you’re on track to meet your daily activity goals. The On Track gauge is like a speedometer (but it doesn’t measure speed). The gauge type is indicated by an icon at the top of the gauge; for example, the Goal gauge has a icon at the top, meaning that the top (central) point around the gauge indicates your daily goal. There will be one or two other icons around the gauge’s circumference; these indicate other levels of activity to which you could aspire. Your current level of achievement is usually represented by a needle that points towards the circumference of the gauge. The needle moves from zero (lower left) to 100% at the top. If you exceed 100%, the needle will continue to move around the right side of the gauge. This means that levels of achievement up to 200% can be represented. The rate gauge is a bit different, and it has a second needle. See here for details. Gauge Type. The gauge type is the value at the top of the gauge. 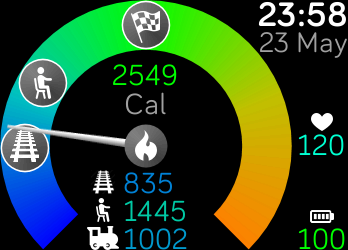 Touch the top third of the screen to cycle between goal , track , coast (energy only), and rate . The currently-displayed type is indicated by an icon on the top of gauge. Activity Type. 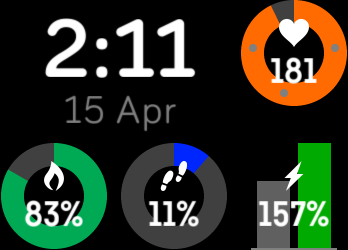 Touch the centre third of the screen (on or beside the gauge’s central hub) to cycle between energy (calories or kJ), steps , distance (km or miles), and time (active minutes). The currently-displayed activity type is indicated on the gauge’s central hub. 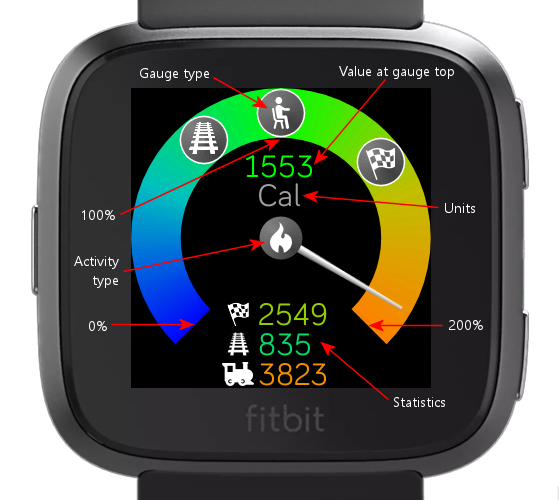 The units in which the activity is measured will be displayed above the hub (unless you hide the statistics). Statistics Format. Touch the lower third of the screen to cycle between no statistics, absolute values, difference from the gauge’s central value (indicated by the gauge type icon at the top of the gauge), and percentage difference from central value. In addition, there are many settings that can be changed via the Fitbit app on your phone/tablet/computer. Goal : the level of activity that you should reach by the end of the day. 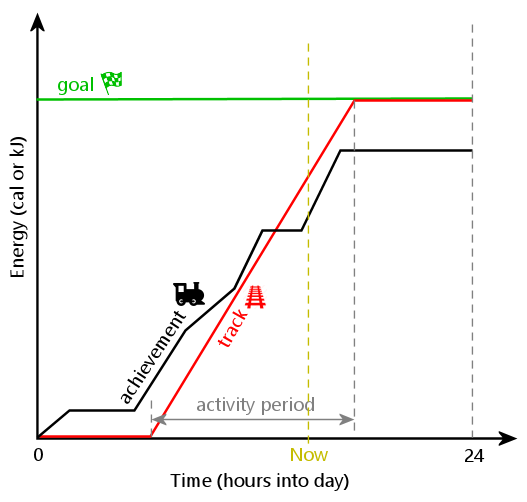 Track : the level of activity that you should have reached by the current time, assuming that your activity is undertaken at a steady rate during your daily ‘activity period’. Coast (energy only): the level of activity that, if reached, would allow you to ‘coast’ (ie, do nothing) for the rest of the day and still meet your energy goal. This is possible because of your body’s ‘basal metabolic rate’ (BMR), which is the amount of energy you expend simply from being alive (even if sleeping or sitting down). It usually contributes more than half of your daily energy goal. As a result, it is not necessary to exercise until you reach your energy goal. If you exercise until you reach your ‘coast’ value, you can then relax in the knowledge that your BMR will get you the rest of the way. Achievement : the level of activity that you’ve actually done so far today. The Goal gauge is the easiest to understand. Your daily goal is indicated at the top of the gauge. There will also be a icon that indicates what you should have achieved by now to be on track. 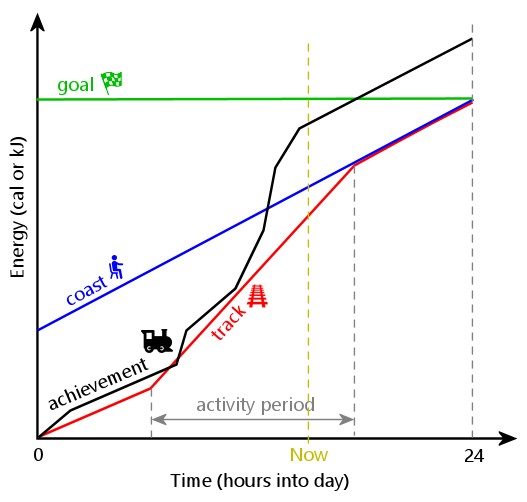 If the activity measure is energy, there will be a icon that indicates what you should have achieved by now if you wanted to coast (ie, do nothing) for the rest of the day. The Track gauge is very similar to the Goal gauge. The difference is that the Track icon is placed at the top of the gauge, and the other icons are moved around accordingly. At the start of the day, the Track requirement for most activity measures is zero (because On Track assumes that you don’t do any activity before the start of your activity period). For this reason, the scale of the Track gauge can’t be based on the Track requirement; for example, if the track requirement was zero and your current achievement was 10 steps, you’d be infinitely far ahead. To avoid this problem, distances around the Track gauge are in terms of your daily goal; ie, the left end of the gauge indicates one goals-worth of activity behind track, and the right end of the gauge indicates one goals-worth ahead of track. If you have taken zero steps by the middle of your activity period, the Track gauge will not indicate zero. This is because you’re actually only half way behind where you should be, in terms of your daily goal (typically 10,000 steps). The gauge will indicate 5,000 steps behind track, which is half way around the left side of the gauge. To see a zero reading, you’d need to be 10,000 steps behind your track, which can only happen on or after the end of your activity period. At the start of the day, you will be nearly on track because the track requirement will be low. Remember that the needle indicates how close you are to being on track, rather than what you’ve achieved. The Coast gauge is very similar to the Track gauge. In this case, the Coast icon is placed at the top of the gauge, and the other icons are moved around accordingly. As with the Track gauge, distances around the Coast gauge are based on your daily goal. Despite having a similar appearance, the Rate gauge is quite different to the Goal, Track and Coast gauges. The central (100%) value for the Rate gauge is the average hourly level of activity that needs to be achieved during your activity period. This value is shown below the walking icon at the top of the gauge. The central (100%) value of the Rate gauge is the gradient of the Track lines on the diagrams above. In addition to the average rate icon at the top of the gauge, there are two other icons around the circumference of the gauge. 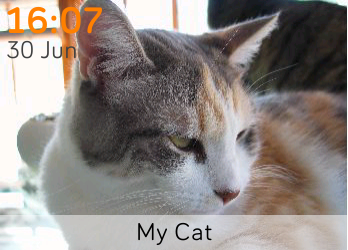 The sitting icon is at the zero position. At this point, you wouldn’t need to do any more activity today to meet your daily goal. The running icon is on the other side of the gauge. At this point, you’d need to exercise at twice the average rate to meet your goal. The long needle indicates the average rate you need to achieve from now until the end of your activity period to ensure that you’ll meet your daily goal, considering your level of achievement so far. The corresponding statistic is displayed beside the sunset icon . If the current time is after the end of your activity period, this needle will be semi-transparent, and will indicate that you either reached the requirement (in which case it will indicate zero) or you didn’t (in which case it will indicate a maximum value and be shaded red). The short needle indicates the average rate you need to achieve from now until the end of the day to ensure that you’ll meet your daily goal. The corresponding statistic is displayed beside the moon icon . When you’re looking at energy (calories or kJ), these rates take your BMR into account. As a consequence, the activity rate indicated by the long needle will not get you all the way to your energy goal at the end of your activity period, because your BMR will take you the rest of the way. On Track can display values that correspond to the icon and needle positions on the gauge. 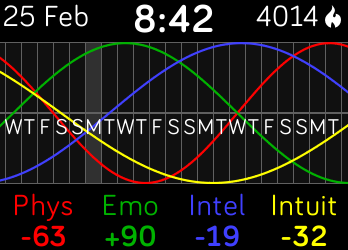 Touching the lower third of the watch screen cycles between the various options. The value that corresponds to the gauge type icon at the top of the gauge appears immediately below that icon (ie, in the upper half of the gauge). Other values can appear in the lower half of the gauge. Values that correspond to icons on the gauge circumference are preceded by those icons (albeit smaller). Your current level of achievement is displayed at the bottom, and is preceded by a train icon (after all, trains are supposed to be on track). The rate gauge can show statistics corresponding to each needle: see here. Absolute values. The actual value of each statistic is displayed. Relative values. The amount by which the value differs from the gauge’s central value (shown at the top) is displayed. These values are preceded by + or - (unless 0). The topmost value is always displayed as an absolute value, since this is the value against which the others are compared. Percentage values. The percentage statistics are the same as the relative statistics, but expressed as percentages. Percentages for the Track and Coast gauge types are calculated by dividing by the goal value, rather than the track or coast value. The reason is explained here. A statistic of ‘—’ indicates infinity. A statistic of ‘. . .’ indicates that the value is too large to display. Select the times between which you are normally active. On Track uses this period to calculate your track requirement (see these diagrams). In addition, the Rate gauge’s long needle indicates the average level of activity you need to do before the end of the activity period. Normally, the zero position of the Rate gauge is on the left side (as it is with the other gauge types). Values on the left side indicate that you don’t have to do much more exercise (if any); this would be because you’ve already done more than the average amount expected by the current time. This means that high levels of achievement correspond to values on the left, which is the opposite of the other gauge types. If you want the rate gauge to indicate high levels of achievement on the right (so it’s consistent with the other gauge types), you can reverse the rate gauge. Doing this does not change the meaning of the gauge: it still indicates what you need to do, rather than what you have done. It just puts the zero point on the right instead of the left. On Track’s icon is based on this image. This file is licensed under the Creative Commons Attribution-Share Alike 4.0 International license.